Bromelain is a proteolytic enzyme that is extracted from the stem and juice of pineapple. It was first discovered in the late 1800s but was not used as a dietary supplement until the 1950s. Bromelain is an anti-inflammatory and has been used as a digestive aid and a blood thinner, as well as to treat sports injuries, sinusitis, arthritis, and swelling. Bromelain is also being studied for use as a supplement for inflammatory bowel disease (IBD), especially ulcerative colitis . Bromelain digests proteins, which is why it is also used as a meat tenderizer. As a supplement, it is available as capsules or tablets. As a digestive aid, the recommended dosage is generally 500 mg three times per day. It can be taken with food but is more effective in reducing inflammation when taken on an empty stomach. Bromelain is approved in Germany for use after surgery, where dosages range from 80 to 320 mg per day. The optimal dosage for other uses, such as for treating arthritis, is not known. Bromelain is normally taken for 8 to 10 days. Bromelain is an anti-inflammatory, but there is not much research to support its use in either Crohn's disease or ulcerative colitis. There is a case report of two patients with ulcerative colitis who responded well to treatment with bromelain. Bromelain has not been studied on humans with IBD, but there is one study that was done on the biopsy tissue taken from the intestine of people with Crohn's disease and ulcerative colitis. The tissue did appear to respond positively to the bromelain and showed fewer IBD markers than the tissue that was not treated with bromelain. 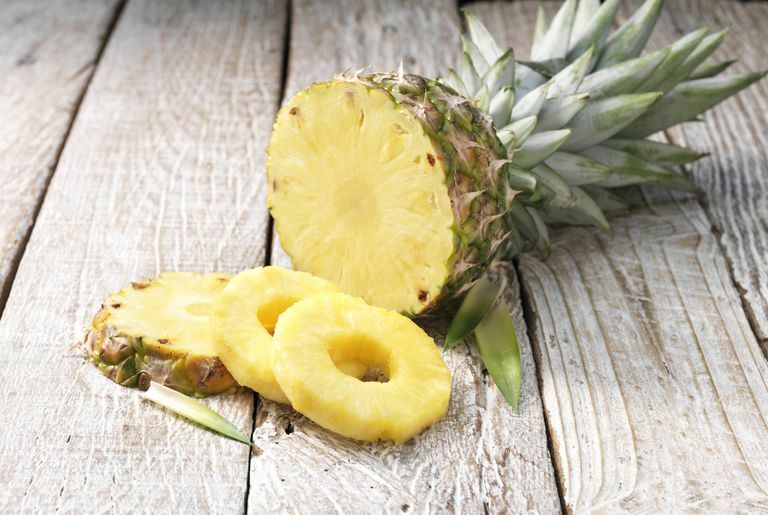 Eating large amounts of the fruit of the pineapple will not give the same effect as taking a bromelain supplement. Bromelain is primarily found in the stem of the pineapple, which is not normally eaten. Bromelain may increase the effectiveness of some antibiotics, including amoxicillin. It may have a similar effect on tetracycline, but the current research on this is conflicting. As with any drug or supplement, there is always a chance of an allergic reaction. Bromelain should be avoided by anyone who has a known allergy to pineapple or other plants in the Bromeliaceae family. Bromelain has not been studied extensively in women who are pregnant or breastfeeding. Because bromelain may cause uterine bleeding, is not recommended for use by women who are pregnant or breastfeeding. Tell your doctor if you are pregnant or breastfeeding and have taken or are thinking about taking bromelain. Even though bromelain is approved for some uses in Germany, it is not currently approved in the U.S. to treat any condition. The evidence for its use in IBD is mounting but is currently not robust enough to recommend its widespread use. Tell your doctor if you are considering the use of bromelain, or if you are currently taking bromelain. Kane S, Goldberg MJ. "Use of bromelain for mild ulcerative colitis." Ann Intern Med 18 Apr 2000;132:680. Ke F, Yadav PK, Ju LZ. "Herbal Medicine in the Treatment of Ulcerative Colitis." Saudi Journal of Gastroenterology: Official Journal of the Saudi Gastroenterology Association. 2012;18(1):3-10. Onken JE, Greer PK, Calingaert B, Hale LP. "Bromelain treatment decreases secretion of pro-inflammatory cytokines and chemokines by colon biopsies in vitro." Clin Immunol Mar 2008;126:345-352. Tinozzi S, Venegoni A. "Effect of bromelain on serum and tissue levels of amoxicillin." Drugs Exptl Clin Res 1978;4:39-44.